At a glance, it is instantly apparent this timepiece has been designed for performing in the water, on land and in the skies. It comes across loud and clear. Mission Bay has a bold character, a masculine appearance and the total black look for those who know what they want and how to get it. 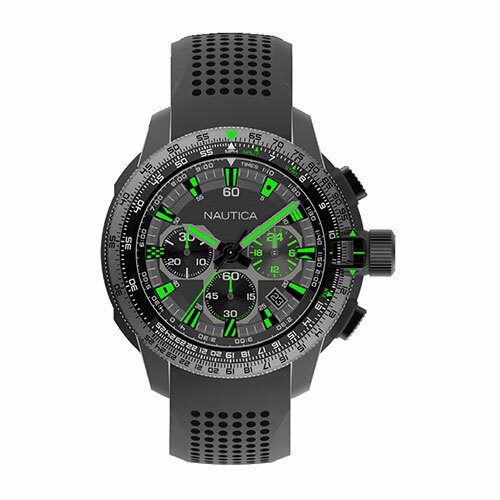 Always, in any situation: no objective is impossible for this chronograph designed with action in mind. 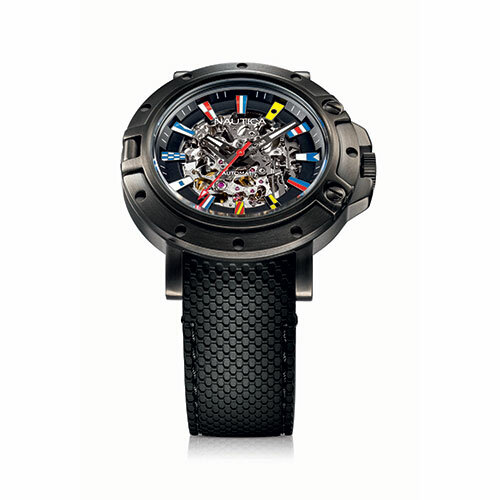 The attitude is made of steel, as is the 46-millimeter case with a supersize screw crown. The style accent is placed on the bright red or green luminous indices and hands which contrast against the black. Mission Bay is the loyal, reliable companion for any feat, thanks to its resistance to 10 atmospheres and the wealth of information displayed on the multifunction instrument dial. Its DNA is one hundred percent Nautica Watches: this is revealed by the 12 iconic flags from the nautical alphabet marking the indices. And the knowledge you can depend on it. Always. There is never enough time for those who live their days intensely. The multifunction Freeboard is designed for the man who manages to find the right time for every passion he nurtures. A perfect combination of aesthetic and practical elements gives the timepiece its sporting, versatile look. 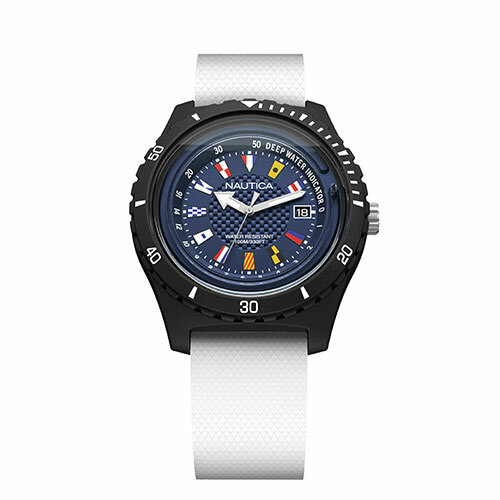 Geared towards the sea, its indices feature twelve flags spelling out the letters of Nautica Watch, and it is water resistant to a depth of 100m. A rapid glance at the sophisticated version in orange on a dark dial releases a thrill of excitement for the man behind the wheel of a vehicle used to high speeds. The dynamic elegance of the multifunction makes Freeboard the perfect partner for a sporting jacket, to be shown off at any occasion. Different spirits are interpreted by this unique watch, which captures the moment and becomes its protagonist. who never stand still and love sharing their best times with their friends. The movement with date indicator is water resistant to a depth of 100 meters. 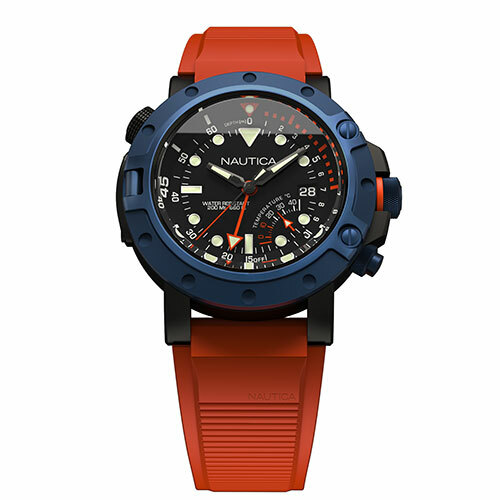 Available in four colorways, each Surfside has special transparent resin packaging that recalls the colorways of the blue dial, with a black or contrasting orange depth gauge, or of the strap, also available in a tone-on-tone camouflage version. The inspiration is the ocean, the look urban: the Porthole Slim's iconic porthole-shaped 44 mm case defines the dynamism of the young gentleman with a packed agenda. The Porthole Slim marks time with the sportiness of an informal and wearable look for every occasion, from office to freetime. The skeletonised luminescent hour and minute hands, the style of the indexes, and the day/date window at 3 o'clock are reminiscent of the iconography of the sixties, a period that really made a difference for men's style. The ocean blue dial lets you play with your inspiration and pairings, choosing between the strap and bracelet that come with the watch: classic leather in black or two shades of brown, plus a sportier steel bracelet. 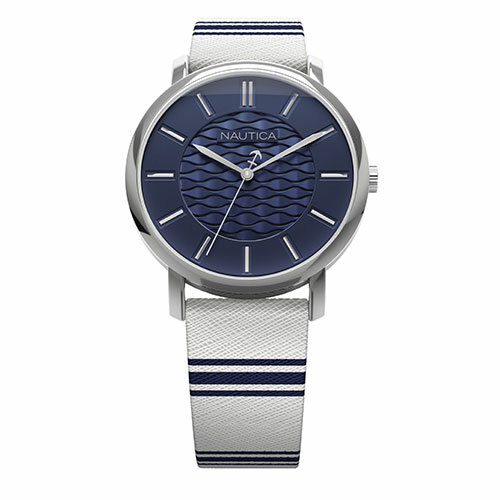 Nautica Watches turns 25 and to celebrate unveils a limited-edition, Porthole 25th Anniversary collection. Highly technical in its appearance and mechanics, the iconic case, with its easily recognizable porthole design, comes in gun metal colored steel. But above all the timepiece boasts an open-worked automatic movement, that can be admired from both sides through the transparent dial and case back. For the first time ever, the timepiece's indexes are adorned with the traditional colored flags which in the International Nautical Code spell out "Nautica Style". A limited-edition item for collectors, with only 500 timepieces produced, Porthole 25th Anniversary is an unmistakable sign of style and watchmaking culture. Seen through a porthole, time is something special. When you think you've captured it, it sprints off unexpectedly, inviting you to keep up with its inexhaustible dynamism. This is the dimension of Porthole Dive, one of the Nautica collection's most iconic models, with its distinctive porthole-shaped 48 mm case. The bold case body is water resistant to 20 ATM / 200 m depth, while the dial with temperature indicator and depth gauge let you see what's hiding beneath the surface of the sea. The sporty design and perfect combination of dark blue case with orange silicone strap make it an ideal travelling companion to set sail on the route to freedom. Even when you're far from the waves. 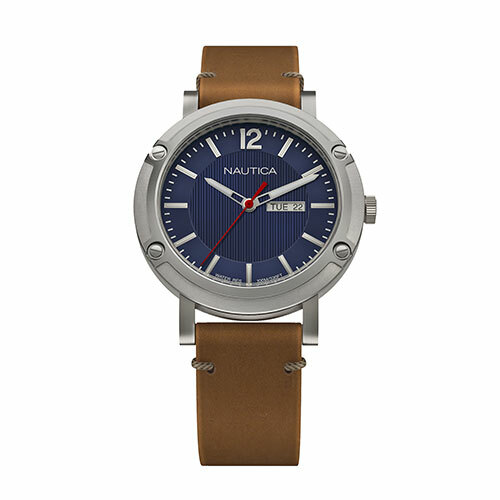 Nautica Watches breathes new life into the aviator watch with the Millrock collection. 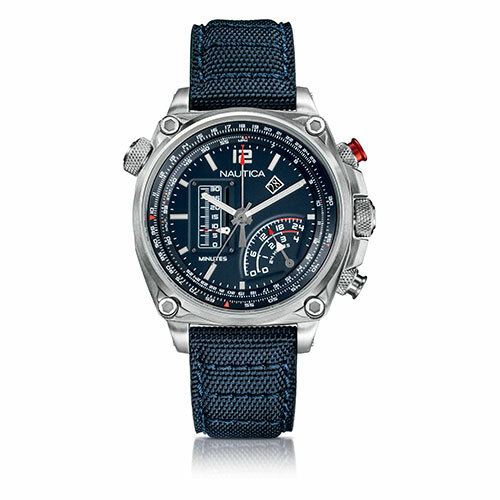 This collection boasts a series of chronographs with unique displays. In place of traditional counters, timed minutes are shown by a linear display, timed hours are displayed in a circular sector between 4 and 5 o'clock, and timed seconds by the central sweep seconds hand. Additionally, the quartz movement displays a second time zone with a coaxial 24-hour scale on the hour display, the distinctive slide rule on the réhaut, and the date window between 1 and 2 o'clock. The majestic tonneau case in satin-finish steel is secured by Allen screws, which are knurled just like the crown with its protection guards, as well as the base of the push buttons - one of them being a stop/start button which stands out in red. The technical look is completed with the canvas denimstyle strap with leather underside. Also available with a black dial and military green strap, or in an all-black version, Millrock is a watch with an urban spirit and is highly functional and suited for globetrotters. 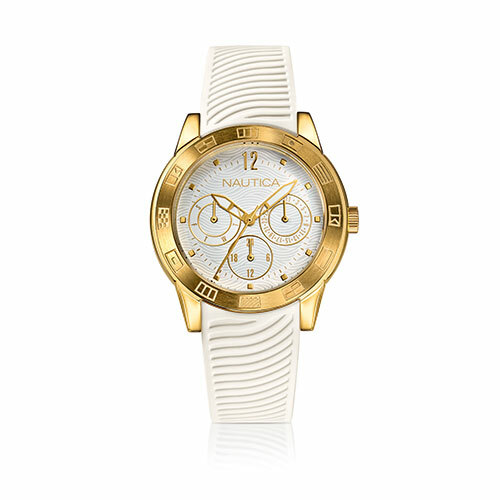 Nautica Watches launches Long Beach, a completely novel timepiece exclusively for women. The smaller case is customized with monochromatic iconic flags that are engraved into the bezel for a sleek and sophisticated look, while the dial and silicone strap feature a symbolic wave motif reminiscent of the sea. The collection is comprised of 3 versions which play with white and blue tones, and another 3 with a steel bracelet in IP rose gold or yellow, with satin-finish links. The multifunction movement displays the date, day of the week, and the 24-hour format with three different counters. With its chic sport style, Long Beach exudes a casual elegance that can be worn from work to weekend. Young-spirited and classic, the Jones Beach collection takes on Nautica Watches' sporty DNA and reinterprets it with a fresh outlook. Comfortable to wear and pleasing to the eye, the XL case, which is water resistant up to 10atm, has a rubber-coated bezel and a sunray dial adorned with a Nautical wave pattern. 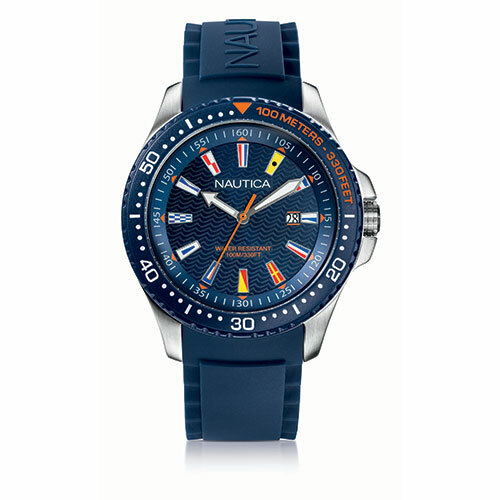 The colored flags of the International Nautical mCode expressing the message "Nautica Style" reveal the brand's identity right from the first glance. Available in 5 versions, from total white to blue or black with the silicone strap, or with the steel bracelet, Jones Beach is just as ideal for a windsurfing trip as it is for a walk in the park. The new Coral Gables collection for women takes its name from the exclusive residential area of Miami, famous for its mediterranean Revival style architecture. 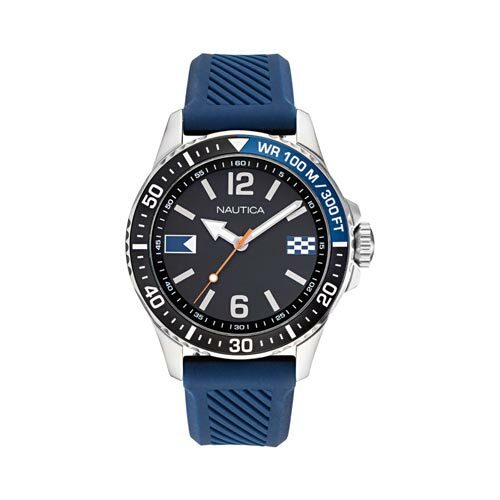 This timepiece reminds us of the area's luminous elegance and charts a brand new course for Nautica Watches. The subtle seduction of the lines becomes a play of references in the hands, the indexes and the finishing of the slim stainless steel case with ion plating. The mood is one of a lovely day under an unfurled sail, in the ocean blue of the dial with wave texture, in the rocker arm of the stylised seconds hand, and in the white saffiano leather strap too, with striped digital print. The clean design makes Coral Gables an accessory to wear at any time of day. Simply chic.